About me - chefcyndis jimdo page! 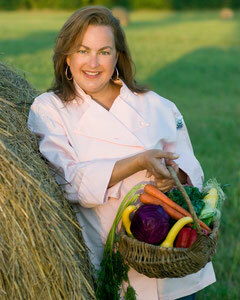 I began my career as a Personal Chef in 2006, after spending 20 years in the Corporate Event Planning industry. Applying my skill and knowledge of healthy, organic cooking, including a wide range of global cuisines, I am available to answer the need families have for customized and healthy meals prepared in their home. I also teach specialized cooking, including Gluten Free food preparation at Whole Foods in the Franklin, TN location. Most of my clients are Entertainment Artists, Physicians, Business Professionals and Athletes in the Nashville area who depend on healthful and flavorful cooking to keep them in shape and enhance their stamina and performance. Some of the better known clients I have worked with are Scott Hamilton, figure skating professional, Jason Arnott, Captain of the Predators, Brad Paisley, Country Music Artist, Alan Jackson, Country Music Artist, amongst others. My passion is to teach people the importance of healthy and organic foods and to see people live in optimal health by nourishing their bodies with life-giving foods that are delicious and simple to prepare. My desire is to provide tools to help people fight against obesity, diabetes, heart disease, cancer and other illness that are prematurely killing Americans! I want my legacy to be that I inspired people to eat healthy and enjoy living food so that they will live well.